WASHINGTON, Oct 2 2013 (IPS) - Like the proverbial skunk at the garden party, Israeli Prime Minister Benjamin Netanyahu used his turn at the podium at the U.N. General Assembly Tuesday to pour scorn on Iran’s new president, 96 hours after a smiling Hassan Rouhani departed New York after a momentous four-day stay that raised unprecedented hopes for détente with the United States and the West. Echoing his early assessment of the Iranian leader, Netanyahu described Rouhani as a “wolf in sheep’s clothing, a wolf who thinks he can pull the eyes – the wool over the eyes of the international community”. He demanded that Iran completely abandon its nuclear programme as the price for lifting existing sanctions against Tehran. “The international community has Iran on the ropes,” Netanyahu said in reference to U.S.-led economic sanctions. “If you want to knock out Iran’s nuclear weapons programme peacefully, don’t let up the pressure. Keep it up. “If Iran advances its nuclear weapons program during negotiations, strengthen the sanctions,” he added. In a speech that dwelt almost exclusively on Iran, the Israeli leader also suggested, as he has oftentimes in the past, that he was prepared to order unilateral military action against Tehran’s nuclear facilities. Netanyahu’s speech, which came just four days after a telephone conversation between Rouhani and Barack Obama – the first between the leaders of the U.S. and Iran since 1979, followed a more restrained performance by the Israeli leader here Monday during his White House meeting with the U.S. president. Netanyahu’s appearance here and at the U.N. this week in some ways could not come at a worse time for the Israeli leader for a variety of reasons, not least of which was the extremely positive impression left behind by Rouhani and his foreign minister and former U.N. ambassador, Javad Zarif. Zarif remains in New York both to continue consultations with key U.S. opinion-shapers and prepare for the Oct. 15-16 negotiations between Iran and the so-called P5+1 (U.S., Britain, France, China, Russia plus Germany) in Geneva on Iran’s nuclear programme. The message conveyed repeatedly by both Iranians in an intense, seemingly non-stop stream of meetings with influential media figures, Iranian Americans, think-tank scholars, and former senior U.S. diplomats and other officials – not to mention Thursday’s 30-minute one-on-one exchange between Zarif and Secretary of State John Kerry on the sidelines of a ministerial meeting of the P5+1 attended by Zarif – was that Tehran was prepared to negotiate verifiable limits to its nuclear programme so long as its right to enrich uranium under the Non-Proliferation Treaty (NPT) was recognised and sanctions were lifted. After those meetings were capped by Obama’s 15-minute phone call to Rouhani as the latter was being driven to JFK airport for his return flight to Iran, the atmosphere surrounding the visit turned almost euphoric, comparable in some ways to Washington’s rapprochement with China in the early 1970s. Media commentators on weekend talk shows and columnists in U.S. newspapers called the visit “historic” and a potential “turning point” in U.S. relations with a country which it has treated as an enemy for some 34 years. “The Israeli government has clearly been rattled by the Iranian charm offensive,” noted the New York Times in what has to be considered an understatement given what it called the “dizzying diplomatic developments” set off by Rouhani’s visit. But aside from being thrown off-balance by Rouhani’s success, Netanyahu also faced an unusual public-relations problem this week: Tuesday’s partial shutdown of the U.S. government resulting from the budgetary impasse between the White House and the Republican-led House of Representatives dominated the news agenda, effectively diminishing Netanyahu’s customary command of the media spotlight and hence, his message. But even his message – particularly, his demands that Iran completely dismantle its nuclear programme and abandon its right to enrich under the NPT – has come to be viewed by a large consensus of Iran and foreign-policy specialists here as a non-starter for negotiations and clearly identifies Israel as a spoiler. “We all know that the chance of a [negotiated] settlement is reduced to near zero when we start with pre-conditions that Iran must totally dismantle its entire scientific infrastructure,” said Gary Sick, an Iran specialist at Columbia University who served on the National Security Council under Presidents Ford, Carter, and Reagan. “Limits yes, but the days of zero or near-zero centrifuges are long past,” he told IPS. Indeed, key figures in the Israel lobby, including Dennis Ross, counselor of the Washington Institute for Near East Policy (WINEP), a spin-off of the powerful American Israel Public Affairs Committee (AIPAC), has argued for more than a year that Washington should test Iran on whether it will accept strict limits on its enrichment programme and, if so, accept it in exchange for eliminating sanctions. Indeed, as early as 2011, when Ross was still serving as Obama’s chief Iran aide, then-Secretary of State Hillary Clinton strongly hinted that Washington could eventually accept a peaceful nuclear programme that included some enrichment capabilities. Even as Rouhani’s U.N. sojourn was unfolding last week, David Harris, the head of the American Jewish Committee (AJC), another major Israel lobby group, warned Netanyahu that his dismissive attitude – as evidenced then by Israel’s boycott of Rouhani’s speech to the General Assembly — toward the Iranian leader risked isolating Israel. Oh dear, what a propagandist piece! The opening line at least provided the prejudice of Lobe which is fair enough, but it also destroyed any possible viewing of his article as balanced. Propaganda? 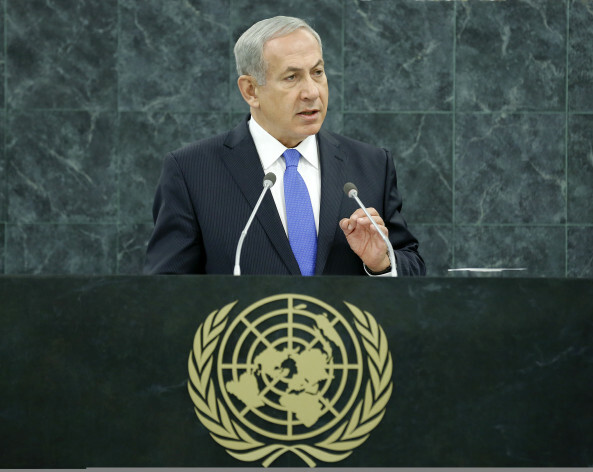 I call Netanyahu standing up at the UN calling for a strike on Iran to take out its nuclear facilities while sitting on a pile of nukes (thank you, Vanunu), estimated at between 250+ warheads, NOT open for inspection because Israel refuses to sign the NPT–HYPOCRISY. It just wasn’t Netanyahoos day[s] here in the U.S. It’s time everyone sees the real Israeli intention[s] in the M.E. They have been at war since they took over, were given their slice of Palestine, renaming it Israel. They also have a nasty track record in the human rights department. As they insist on reminding everyone about the tragedy at the hands of the NAZIS in WWll on an almost daily basis, yet at the same time, what do they call the way they treat the Palestinians as an occupier? They have been at war with their neighbors, that it’s maybe impossible for the ZIONISTS to do anything else. Dragging the M.E. along from the 20th century thinking here in the 21st century, is just plain backwards. Time for all the warmongers to retire to their apartments, stay there, instead of stirring the pot in the manner they have. After all, when somebody in effect steals, murders, saying it’s done on self defense, doesn’t understand that their actions are responsible for the other party to object/resist. Perhaps they have gone to far past the Rubicon. to change their ways, but if that’s so, then they should get out of the kitchen and let a different set of cooks in, ones who seek a better menu than the present one. Kayos, you really should read before you respond. My comment was not about the issue but Mr Lobe compromising his situation as presumably valid ‘reporter’ with his opening remark. Referring to Netanyahu as the ‘skunk’ immediately debases any folloiwing argument. A skunk by any other name is a skunk. I’m with ‘originalone’ on this one. Kayos. Evidently your own prejudice is making it impossible for you to read my comment. You can carry that wherever you like as it is presented as your personal opinion, and again that’s fair enough. For the last time to be accepted as a ‘Reporter’ it should be part of the role to at least dress up one’s prejudice in some fact-based oratory. Lobe lost his credibility with his headline, THAT’s the point I have been trying to make. Why is Obama talking to Rouhani at all? He should tell Rouhani to go discuss it with Netanyahu directly. If Rouhani can convince Netanyahu that his nuclear program is peaceful, then the US will lift the sanctions. Obama should tell Rouhani not to bother him but to call Bibi and talk to him directly. Whatever Bibi decides, Obama will oblige Israel by either increasing or lifting the sanctions. These so-called “Palestinians” are the source of troubles in the world. They could even lead to the destruction of Iran, not to mention themselves. They have a state in eastern Palestine now called “Jordan.” It is majority Palestinian right now. They should stop going around with their poisonous propaganda and claiming that Jewish soil belongs to them. Everyone knows that Israel is Jewish land. Jerusalem is not even mentioned once in the Quran. It’s these “Palestinians” who are the problem, and the solution lies in eastern Palestine, or “Jordan” as it presently called. Oh the trope of ‘so-called “Palestinians”‘ and the misappropriation of responsibility to deflect from Israel’s crimes. Please provide evidence for how Palestinians ‘could even lead to the destruction of Iran’ I’m sure we would all like to know that. Secondly, the hasbara claim that Jordan=Palestine is not supported by facts. You see, facts are available and verifiable, like the fact that Jordan became sovereign, as Trans-Jordan, in 1946 and was never part of the Partition Plan. The Jews who migrated Mandate Palestine agreed in their declaration of independence of the state of Israel specifically referenced and agreed the area allotted to Jews in the Partition Plan and the borders thereof; those are the only sovereign, lawful and recognized borders of Israel. The area of the Partition Plan allotted to Palestinians, called Palestine, remains Palestine, regardless whether the Palestinians accepted or rejected the Partition Plan at the time. That territory does not become forfeit, nor does it transfer to Israel, it is lawfully still Palestinian territory, now a non-sovereign state, with accepted lawful borders recognized and accepted by the community of nations and the UN, with East Jerusalem as its capital city. Those are immutable facts. Everyone knows that Israel, within Israel’s actual 1948 declared borders, is Israeli territory. Jerusalem is (including West Jerusalem) still outside of Israel’s actual borders, and remains occupied despite Israel’s attempted annexation, which was rejected by the UN as unlawful. You must know that Americans are learning more and more verifiable facts (with documents) about this situation, and we really don’t appreciate being propagandized by Israel or our own media. Why would you take issue with that? Even in Israeli media, it is not only accepted but embraced that Netanyahu came to our country as a ‘spoil sport’ with respect to our impending rapprochement with Iran. That’s not in America’s interest. It is in America’s interest to have rapprochement with Iran, to have full diplomatic and trade ties with our natural ally, Iran. Israel’s problems are its own, and we are not responsible for Israel, or solving its problems. Do you dispute that Israel’s government wants to scupper American discussion with Iran? Do you dispute that Israelis want to bomb Iran instead of giving diplomacy a chance? Do you dispute that Netanyahu is a known liar and has been hysterical about Iran and its non-existent nuclear weapons program (as opposed to its actual civilian nuclear program) since the 1990s? Do you dispute that Israel has been pushing the US to heap more and more sanctions on Iran? Do you dispute that what Netanyahu offers is in direct contradiction to the IAEA report, and that of our 17 intelligence agencies and even Israel’s intelligence agency? Do you dispute that what Netanyahu is saying is without basis in verifiable, objective facts? Do you dispute that Israel has a nuclear weapons cache? Do you dispute that Israel has not signed the NPT or ratified the CWC, as Iran has? Please provide evidence to support your claims. Iran is made of rubber, Israel of glue, every accusation Israel makes bounces back and sticks on Jews. The deal is, even if the Iranians shut down their entire nuclear arsenal of one power plant, Israel and their pals in the USA dept collecting department for the banks would still find a way to go to war with them. Like a false flag blamed on iran.